An Amachete user (Thanks Henrik!) recently referred me to this review, where someone suggested that a Keyword Index Checker got their account suspended. The two most important things for me, with Amachete, are the privacy of user data, and preventing our users from engaging in TOS violating behavior. Wait what’s a keyword index checker? Well, to answer that question, you have to know what being “indexed” is. Let’s say, for some inexplicable reason, you decide to sell ‘pet birthday hats’. Before you go into it, you decide to check out the competition, so you type ‘pet birthday hats’ into Amazon, and a number of listings pop up. All of those listings are *indexed* for Amazon’s database, for the search term ‘pet birthday hats.‘ Meaning that because of their backend/front end keywords/search index/whatever Amazon thinks these accounts matter. So why do I care about Keyword Indexing? Periodically, for reasons that aren’t entirely clear, to me anyway, Amazon doesn’t always index your item for Keywords. Maybe when you uploaded your flat file there was an error. Maybe you changed root nodes and something didn’t save right. Whatever. Periodically your sales will just slip away and it’ll be because you aren’t indexed for ‘pet birthday hats’. More simply: Users type in the phrase, your listing doesn’t show up. You aren’t indexed. How do I know if an ASIN is indexed for a keyword? You can see that this item is nowhere to be found for “cat feeder.” It is completely UNINDEXED. Okay great, so I can search for all my search terms, with my ASIN to make sure that Amazon has them indexed? Awesome! Wait that’s going to take a while, someone should make a program that…OOHHHHHHH. Exactly. A keyword index checker is a pretty boring piece of technology in the grand scheme of things. All you do is ask the user for a list of search terms (Cut and pasted from their back end), their ASIN, and then visit the above URLs with all of the search terms, and compare the results and make sure that they are there. Using the trial of KW Checker indicates just that it does exactly that. Interesting thing here, is that it appears that “puppy” is actually indexed for this listing, which makes me reconsider my initial thought about “puppy birthday hat”. Interesting. Removing the quotes gives some credence to the idea that Amazon, through some mechanism or another indexes search terms (“puppy birthday hat”) differently than they do back end keywords (“puppy, birthday, hat”) as this item shows up as being indexed for the keyword one, but not the search term one. However it does show up for the search term “pet birthday hat” which is right there in the title. This will take some diving into, but my current thought now is that if you have a search term that is converting, make sure it’s _hard indexed_ and not soft indexed. You’re rambling. What does this have to do with KW Checker? Without this link between seller and checker, it’s harmless, because if it *were* harmful without the link you could weaponize KW Checker. You can have all these search terms! Can I have your vote? You could easily use it to shut down your competitions accounts simply by taking your keywords and aiming it at their asins and running it again and again and again. There’s no world where if you just enter a bunch of asins and keywords and check them constantly then Amazon will just start shutting down all those listings. *Unless you are a tinfoil-hat person who thinks that Amazon is linking your browser activity to your seller account, etc etc, which is really the path to madness. If this is really a concern, (which it shouldn’t be), then just use a proxy or a different person’s computer but honestly don’t bother. 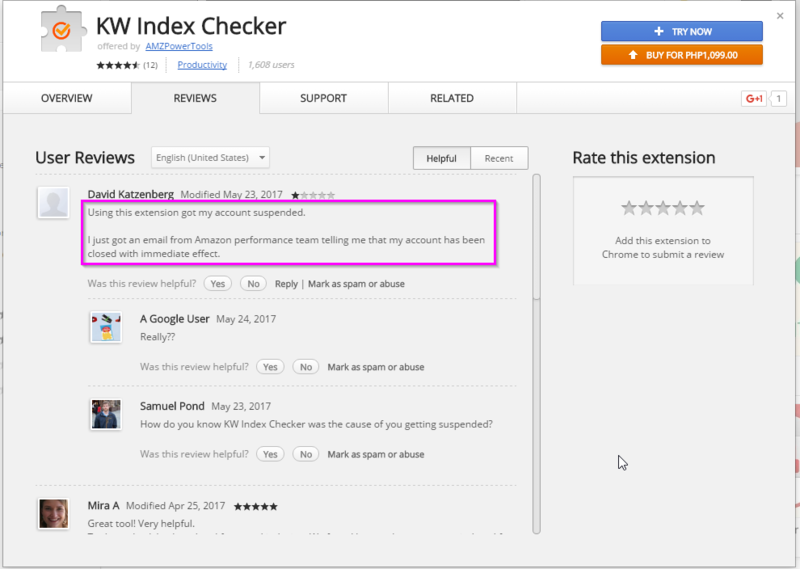 The good news about KW checker is that it’s almost certainly safe for checking keyword indexing. The bad news is that it’s probably not very good for checking search terms. great input, thank you for the explanation! Previous PostPrevious Jeff Bezos’s Yearly Letter, and what it means for FBA Sellers? Next PostNext Q&A: What do I do when the 999 trick won’t work?